USES: In rustic desserts, candies, syrups and beverages. FINDING: In most Mexican groceries and via the internet. CHOOSING: Light-colored piloncillo has the lightest flavor; dark piloncillo has a stronger molasses tang. 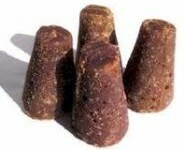 Piloncillo is always sold in a solid mass, usually in a cone, that varies in size from ¾-ounce to over a kilo; a standard-size cone is 8 to 10 ounces. STORING: In a cool, dark, dry place, well wrapped, for a year or more.